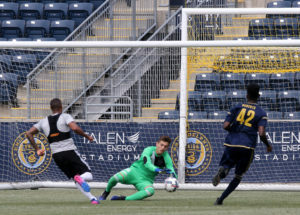 Astute Lehigh Valley soccer fans observing Bethlehem Steel FC have noticed that a third phase of the player development side’s season has begun. Familiar names who have played at Goodman Stadium this season such as Mark McKenzie, Josue Monge, Jahili Waite, Matt Freese and Dawson McCartney have disappeared from the lists of the game-day eighteen. These academy graduates have gone off to college and are being replaced by new names from YSC Academy’s growth process. 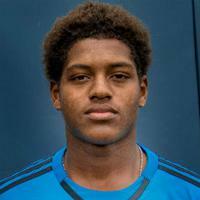 One of these names is already quite familiar to Steel fans – 16-year-old Salvadoran youth national team goalkeeper Tomas Romero, who has already played four times for the Steel. He may make it five this coming Saturday because of the seven-stitch hand laceration suffered by Jamaican national team captain and Union goalkeeper Andre Blake in the Gold Cup final. Romero has recently been practicing with the first team rather than the Steel (and not just because of Blake’s Gold cup absence), which puts him at the head of the new group of youngsters. Three other young men are frequent, perhaps constant members of the local United Soccer League team’s field-player practice unit, now that their Union Academy U-18 side has finished its season. Two already have game time on the pitch, while the third is remediating a minor soft tissue injury. and creativity with the ball. Burke asserted that four players qualify according to that criteria, and that he is pleased to welcome them to the Steel. They are central channel midfielder Brenden Aaronson (16 years and nine months old), flank midfielder Seth Kuhn (17 years and three months old), and defender Nyk Sessock (17 years and one month old). Aaronson (below) was substituted for Chris Wingate in the central midfield against Pittsburgh on July 15, when the blond Norwegian felt something in a hamstring and was wisely replaced, and Burke clearly liked the substitute’s mentality. In his 48 minutes on the pitch, Aaronson raised his game to meet the physical challenge brought by the Riverhounds’ Romeo Parkes. In that same game, Seth Kuhn (right) got a six-minute introduction at the end on the right flank, during which time he audaciously scooped a ball over his defender and tried to run onto it as the Steel were seeking a tiebreaker. The move failed to produce but his coach complimented the boldness. In practice, Kuhn is fully integrated into the regular rotation of midfielders in all drills. More match time will come, especially while first-teamer Fabian Herbers recovers from surgery. Nyk Sessock (below) has yet to see the pitch in the regular season, as he has what Burke called a small knock. PSP saw him working hard at rehab in practice a week ago Tuesday, after doing the general warmup with the full squad and cardiovascular conditioning. Back in the February preseason scrimmage against Villanova, Sessock played quite credibly as a right back with good offensive potential. With Aaron Jones set to miss the Steel’s next game because of a red card, the match against Ottawa might be Sessock’s debut on the bench if he has recovered. Of course, goalkeepers are crucial in training sessions at the professional level as – like catchers in baseball – you can never have too many. Kris Shakes (16 years and three months old/to the right) is currently on break with his family after a strenuous season with the academy, so Eoin Gawronski (16 years 4 months, pictured below) has backed up Romero against Pittsburgh and Richmond in the last three weeks. Three or sometimes four keepers have worked with coach Jay Cooney during the Steel practices this season. At this particular moment, men who may have played for Reading might fill the remaining practice slots behind Gawronski, as their season is over but college has not quite resumed. Cooney’s keeper corps is young. Romero is sometimes up with first-team coach Oda Nikolov but with Shakes and Gawrownski, there are three keepers under seventeen who are practicing regularly at the professional level. The coach and the organization are challenging previous perceptions that keepers accumulate experience more slowly than field players and must be older as they reach their prime. 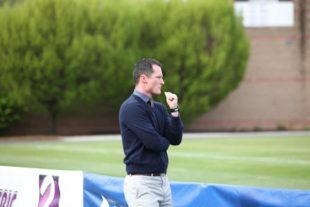 The shift to a new group from the Academy is creating a need for another adjustment of the Steel’s roster depth, primarily because so far in the new group there are no center backs, unlike last season and most of this thus far. The apparent dearth means Matt Mahoney’s emergence enhances his importance to the team, and highlights Burke’s foresight in having him train there. The flight of college-bound players from the team is just one of the many quirks a development side must deal with, but with a slow transfer season for the Union and some promising new talent, the resetting of the Steel’s pipeline should provide for some interesting games and analysis.